There's a princess or a pirate inside every kid. Kids that are battling cancer are no different. Chemotherapy treatments often rob kids of their hair and leave their young scalps too sensitive for traditional wigs. Not so long ago, two moms came up with a great project to help these children. One of the moms, Holly Christensen, an oncology nurse, started with one wig for a friend's child who was battling cancer and lost her golden curls. The child was overjoyed. What Holly thought would be a small project grew to include hundreds of volunteers and thousands of recipients. From the site: "Magic Yarn wigs are made with soft acrylic yarns, and embellished with gems, crocheted flowers, starfish and snowflakes, silk flowers, and nylon/polyester ribbons. Volunteers send us handmade crocheted beanies/hats. At our workshops, we attach long strands of yarn and accessories to the beanies, and style them to resemble a variety of princesses. Our wigs are machine washable when placed in a mesh laundry bag. We deliver them in clear cellophane packaging with a whimsical greeting card and information on our project for their parents. 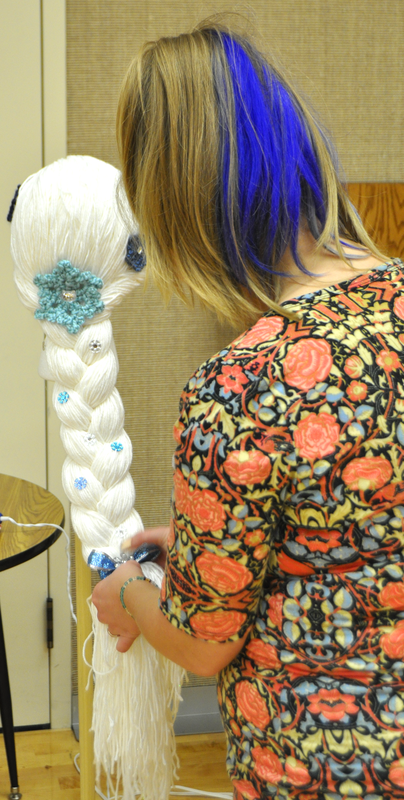 Our wigs are made 100% by volunteers and funded 100% by donations of yarn and money." Due to the huge success of the project, it is now a 501(c)3 non-profit organization. There are chapters across the US and these groups have delivered 8,800 wigs and counting. Wigs are shipped worldwide at no costs to the recipients. Links are provided for people requesting a wig. The Magic Yarn Project site is rich with galleries of kids in their wonderful wigs and of craftivists making the magic happen. An interactive map will point you to your local chapter. . Instructional videos on the site show exactly what you'll need to make each wig.